'Every little helps' might be the motto of a large supermarket, but one large church in Camberley is also doing it's bit to help families this summer holiday. 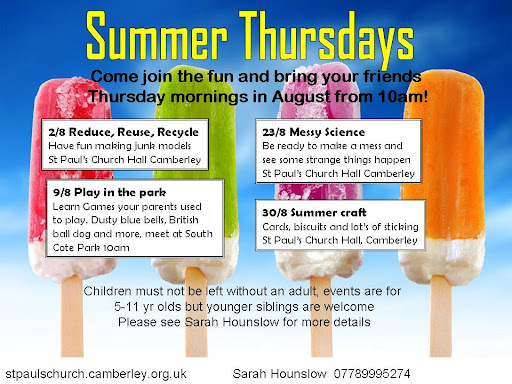 St Paul's on Crawley Ridge, is hosting free children's activities Thursday morning's in August. There's a different theme each week, starting with 'reduced reuse recycle' on 2 August 10am - 12pm. Children's worker, Sarah Hounslow said: "Times are tough for many families right now. 'Living Christ in Camberley' is our mission statement. That means helping and caring for the people of our parish. Providing free fun family activities for 5-11 year old's I hope will help split up their week. This is something that everyone can join in with, it costs nothing." To find out more please visit stpaulscamberley.org.uk or contact Sarah Hounslow on 0778 999 5274. As Camberley News reports this week on the work of the Besom charity, helping people with food parcels in Camberley, lets not overlook Camberley Frontline, the free debt and benefit advice service. Frontline has 4 new recruits that join the 5 existing volunteers. Marianne and Ruth (pictured 1st and 4th from left to right) are two of them, who have recently completed the training course. Why do they do it? I went along to an evening meeting to find out more. Jim is retired, and wanted to do something to help others, inspired by another Frontline adviser's testimony. He is finding the whole experience very rewarding. Ruth and Marianne are new recruits. Marianne heard about Frontline at St Paul's, and having managed the family finances, thought she would put per experience to good use helping others. Ruth is a full time accountant, and wanted to use her skills, helping people in need. Once the new volunteers are up to speed this will make a big difference to Camberley Frontline’s capacity and its ability to help those in need. Charles Bruce from Frontline says: “There is still desperate need to be addressed and the new volunteers will help to do this. Many of the clients are vulnerable people, with some suffering from depression or other illnesses and disabilities. Some, however, are very capable and realise they have a problem and come to us in good time”. Camberley Frontline has now helped or is helping, nearly 40 clients, from all walks of life and as far afield as Aldershot, Bracknell and Wokingham. A third of these have debt problems, a third require benefits advice and a third need help on both. The bulk of them are very vulnerable people hanging on by their fingernails. There are many heart-wrenching stories from people who have approached Frontline, some of which I have blogged about previously. One client told a Frontline adviser, during a telephone conversation, that they were overwhelmed by problems and were going to kill themselves. The emergency services were called, thankfully, in time. Emergency food parcels were arranged , and Frontline are in discussions with their creditors. Frontline are helping this person make an application for a debt relief order (a simpler and cheaper form of bankruptcy), so they are now on the right track towards resolving their issues. In virtually every case, Frontline advisers have been, or are on the way to being, able to achieve a resolution to their clients problems. This can be very time consuming and they still have ongoing cases from clients who have been with them since they “opened shop” in Camberley in 2010. Frontline provide free debt and benefit advice in Camberley. If you need help please contact them. As the world celebrates the Olympic volunteers, I think of our own volunteers at St Paul’s, who tirelessly run our children and youth work, week in, week out. They may not be Olympic athletes, but it takes stamina to devise programmes for 0-18 year olds and direct them. If you need proof, checkout my post on FreeZone – Entering The Zone! Along with staff, Youth Director Sarah Percival, and Children’s worker Sarah Hounslow, a team of volunteers run activities all week. Visiting schools in term-time, running weekend activities such as “Summer Thursday’s” and “Who Let The Dad’s Out”, running youth groups in the evenings or taking a group to summer camp – these are some of the initiatives the leaders co-ordinate. Gael has a close family, with 3 children of her own, Katie, Greg and Eilidh, and 8 grandchildren. She loves spending time with them, and is enjoying the special moments with her grandchildren. Her Scottish mum showed her the importance of family (Gael was born in Dundee). She also likes reading, cooking, and has started playing golf again. She says golf “takes time but is a marvellous way to relax”. When she isn’t volunteering, a perfect day for her would be on a beach, with blue skies, warm sunshine, sharing fun and food with her family. Then bed with a good book at 10 o’clock. But what is her strategy for dealing with not so good days? “Start with prayer and reading encouraging scripture. I keep a collection of verses from the bible for times like these. I also make sure I go out to see someone”. The Bishop of Chelmsford, commenting on the Olympics, said: “Commentators, marvelling at the efficiency with which these Games have been put together, have said it is the largest logistical exercise in Britain since the Second World War. It might also be one of the largest outpourings of good will. This is an Olympic legacy worth holding onto: the desire to serve my neighbour and the desire to celebrate with my neighbour. It is with these things that communities are built”. St Paul’s have served their neighbours in so many ways, and built relationships with the community, and will continue to do so long after the Olympics. For more information on children’s and young people’s activities at St Paul’s, please check out the children and youth sections on the website at stpaulscamberley.org.uk. The Besom are a local charity who specialise in providing food packs and other items to those in need locally. They work with local churches, who provide a support network of collection points, where various items may be dropped off. Camberley Besom have reported an exceptionally busy few months leading up to June, with a massive increase in referrals. In the first four months of 2011 they received 7 referrals and gave out 15 packs in response. In the first four months of this year they received 40 referrals and gave out 132 Packs – an average of 4 packs per referral. This six-fold increase in demand highlights the increased difficulties faced by the local community in Camberley. The Church Urban Fund recently performed a survey on poverty in the UK. They found stark contrasts across the town. Camberley has the least deprived, and most deprived parishes in the diocese of Guildford. For example, the Old Dean (parish of St Martins) ranks 164 out of 165 parishes in the Guildford diocese. This means that this parish is just about the most deprived parish in the diocese. In contrast, Heatherside ranks 1 out of 165, making it the least deprived. To get an idea of how some of the most deprived people are living in the area, I’d like to paint a picture for you. Imagine moving into a new home with just your clothes and a couple of boxes. You are confronted by one bare room and shared facilities. The room has no carpet, no curtains, no furniture or any of the basic things that make up a home. You may have lost your job, your home and spent weeks living in very basic accommodation or sleeping on a friend’s sofa. You may be on your own or struggling to provide for your family. You have nothing, and no money to buy what you need. Life is not good. This is the reality for many people living in Camberley who the charity help out. Now imagine walking into that same room. You have been told all that you need will be provided by the local churches, but your expectations are low. All you expect are well used goods that someone no longer wants. What you get is decent furniture and a fridge, new bedding and towels, a kettle and toaster, food and all the essentials you need to get you started, plus a few treats. St. Vincent De Paul Society and The Besom in Camberley act as a bridge between local churches who donate to the charities, and those in need, to meet all those basic needs. People feel valued and their self-esteem is lifted, and lives are changed. These charities work closely with Frontline in Camberley, who provide free debt and benefit advice. All three charities are staffed by volunteer members of local churches, and partly funded by them. St Paul’s, Camberley, is hosting an evening with former Conservative MP, Ann Widdecombe, author, columnist, celebrity and former Shadow Home Secretary, discussing “Morality in public life”. Ann, aged 65, had a distinguished career as a politician before retiring at the 2010 general election. During this time she took on a range of roles, ending in Shadow Home Secretary. Since retiring, she has written several novels, is a columnist for the Guardian and Daily Mail, and has become a celebrity after appearing as a contestant on Strictly Come Dancing. Recently she even made her debut at London's Royal Opera House in La Fille Du Regiment. Ann is a Christian, and was a member of the Conservative Christian Fellowship. Speaking recently to children from Christ The King College on the Isle of Wight, about faith and aspiration, she told them, “Don’t be discouraged...don’t expect success to come quickly and easily...and none of it’s worth doing unless it’s for God or other people”. This talk continues a series held by St Paul’s around a central theme of "Morality in Public Life". Previous speakers have included Claudia Sturt (Deputy Director Prison Service), Melanie Phillips (columnist and public speaker) and General the Lord Dannatt (ex Chief of the Defence Staff). Doors open 7pm on July 9th at St Paul’s, Crawley Ridge, Camberley, GU15 2AD. Light refreshments will be served at 9pm after the debate. Fee tickets are available by contacting media@stpaulscamberley.org.uk. Questions may be sent in prior to the event. To find out more about St Paul’s, please visit stpaulscamberley.org.uk or contact the office on 01276 700210.